The people have spoken, and Stars has finally listened. 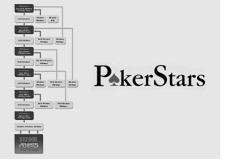 After years of reading emails from their customers, asking for Step Sit and Go's to be introduced, Pokerstars has finally relented and added the Sit and Go's to their site. Party Poker added these a few years ago, and they proved to be immensely popular. Basically, it allows someone who is riding a hot streak to potentially win a very big prize on a very small buy-in. Currently, Pokerstars just has the Step tournaments for entries to the PCA, however I expect that they will soon add normal Step tournaments with cash prizes, as I can guarantee you that these Step tournaments will prove to be very popular with the public. And considering the fact that they will generate Stars a ton of money in rake, I can only see Stars widening the scope of their Step tournaments. Here is how it works. There are six steps. Step 1 is a $7.50 buyin SNG, where the top 2 people progress to step 2. Whoever places third gets to repeat step 1, and the fourth place person gets $1.50. Step 2 is a $27 buyin SNG, and so on and so far. You win a step and you continue up a level. Step 6 is an 18 man SNG with a buyin of $2100, where the top 3 place finishers receive an entry to the PCA. So, if you get going on a very hot streak, you could potentially win a seat for $7.50. You can also buy in directly at any step if you want. Step Sit and Go's are popular with the really good players as well, because they can buy in directly at the highest Step, and theoretically play against a much weaker field than they would normally be used to, due to all of the players who battled their way through the steps being involved in the final step. Bravo to Pokerstars, this will prove to be extremely popular with their players.